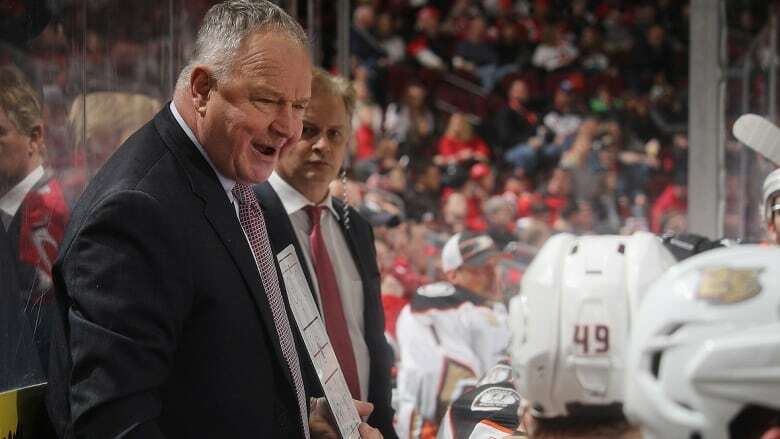 The Anaheim Ducks, who have dropped seven consecutive games, fired head coach Randy Carlyle on Sunday. General manager Bob Murray has been appointed interim bench boss for the rest of the regular season. The NHL team also announced Bob Murray as his replacement on an interim basis for the balance of the regular season. Anaheim will name a new coach following the season. "Difficult decisions need to be made when times are tough, and our play has clearly been unacceptable," Murray, 64, said in a statement. "We have a tradition of success in Anaheim and we need to get back to that." The 62-year-old Carlyle led the Ducks to a Stanley Cup title in 2007 and conference final appearances in 2006, 2007 and 2017]. The 62-year-old Carlyle, who was born in Sudbury, Ont., was in his second stint with Anaheim and guided the club to the playoffs in seven of his eight full seasons. He leaves with a regular-season record of 384-256-96. Murray, on his decision to step in as interim coach:<br><br>"It's my job. I'm looking forward to figuring out what the issues are. One of the biggest things I have to determine is if we have people who can (lead). I haven't given up on them yet, but I'm worried."